First, a few thoughts on this dessert. Ideally, this dessert should be made in a ramekin, with the panna cotta removed afterwards and placed with coulis around it, rather than on top. By placing the coulis on top, it overwhelms the more subtle taste of the pomegranate panna cotta, making the whole thing taste very berry-ish. Second, don't skip the step of straining the cream/gelatin mixture before pouring into cups/ramekins. This will remove any gelatin sedimentation that may have accrued; you can see that in my picture, I did not have time to do that, so a layer of sugary gelatin accumulated on the bottom. Third, the ratio of gelatin to cream is very important, as you don't want the texture to be like that of jello. A smooth, creaminess is desired, and after some testing, I think the one I used here works quite well. Fourth, in this version here, I added a touch of milk foam, to contrast with the heavy cream texture. 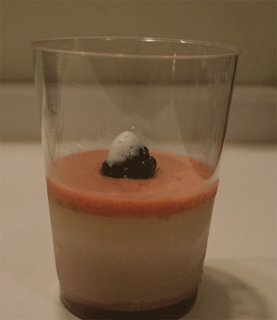 Although, it's more of a garnish here, since there's so little room on the top of the berry. Dissolve 2 envelopes of gelatin in 1 cup of milk. Let stand ~ 5 min. Combine heavy cream, sugar, pom juice into sauce pan. Mix to taste. Add vanilla. Bring to a simmer, but do NOT boil. Add milk/gelatin mixture, and stir to dissolve. Pour into ramekins, and chill in refrigerator for 3-4 hours or until firm. To remove from ramekin molds, use a knife to cut the edges, and dip in a bowl of hot water for 20 seconds, then shake panna cotta loose. To make the coulis, wash and cut the strawberries. Add a 1-2 cups of water, lemon peel, and sugar, and cook until berries are soft. Add berry composition to food processor, and pulse until it is a finely processed. Strain berry mixture. Refrigerate if not using immediately. If coulis is too liquidy, reduce slightly. Add liqueur for that extra kick!